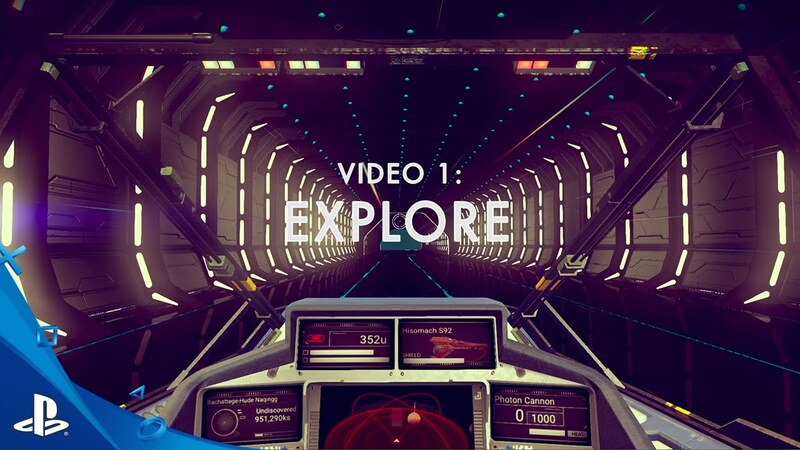 What Can You Do in No Man’s Sky? Hi everyone! So we’re starting the countdown to the launch of No Man’s Sky on August 9. With just a few short weeks until you can get your hands on the game, we wanted to tackle one of the questions we’ve seen crop up a few times: what do you get to do in No Man’s Sky? As Sean Murray from Hello Games has talked about before, there are four key pillars to the game: explore, trade, fight, and survive. Some of you may have seen Sean’s video with Anthony Carboni in which he talks through the game in great detail, but for those of you that haven’t, we’ve pulled together a series of short videos that highlight each of these key pillars. Keep an eye out during the coming weeks as we’ll be dropping new videos showing the highlights of what each pillar means to a player in No Man’s Sky. With more than 18 quintillion planets to be explored across billions of miles of space, there’s plenty to be seen in No Man’s Sky. As the discoverer of flora, fauna, and even planets, you’ll be able to name your discoveries and claim them to be seen by fellow space pioneers. I have been following this games development for a few years. I am so pumped it happening in just a few weeks. I’m so excited for it. Cant wait to learn new languages, explore and conquer planets, and find new life forms!!! Is it going to be VR??? Hopefully we will get a 5th Pillar for the game on October 13th of VR. :-) Can’t wait for the launch and I a big shout out to Hello Games on a truly revolutionary game concept that is now shipping out the door! Explore, trade, fight, survive, and vomit. Virtual reality wouldn’t really be a pillar… That’s kind of like saying that the use of controllers is a pillar. Pillars are things in game, whereas virtual reality would just be another way to play the same game. Preordered and waiting. My childhood’s “future” is finally arriving (virtually, because, let’s face it, no serious money is being spent on space exploration so, yeah, I’ll take the next best thing). Really hope we end up seeing some kind of crafting system added into the game later on. As well as possibly adding in the ability to like make your own large trade vessels where other people can dock ships, or possibly try and take over. So far as in terms of space games. This one has the basic solid points down, so really hoping they expand into other points, other space games are trying to focus on later down the road. If done, No Man’s Sky will probably destroy the current and in the works space exploration games. Have to see what Star Citizen’s final product is. Elite Dangerous is turning out more and more awesome (in my opinion). But add this one, I’ll still play them all. Space sim games are what i built my computer for. Hello. I need subscribe on Playstation Plus for playing this game? You shouldn’t need one as you can play this Offline. @TWODEEEE, this game has an offline mode, as stated by Sean Murray. The data you get does not have to be uploaded to the atlas and there is no ‘server that run the planets’. The planets are all generated locally based on the giant algorithm that they created for this game. I’m all set to go exploring. Preordered and missed out on the limited edition! But can’t wait! This, I am so afraid to buy a game pre-reviews these days since I’ve been burned so often over the last couple years. I hope they don’t decide to Embargo reviews because thats never a good sign. I’m kinda worried about multiplayer and interaction with other players in this “more than 18 quintillion planets to be explored”. Yeah I agree, that’s the only thing keeping me from getting day 1. If it’s just me playing alone and no friends I may just wait for it to drop in price. I love SP games but something like this needs multiplayer with friends. I hate MP with strangers only, if I can’t chat with people I’m playing with this won’t hold much reply after the 100th planet explored with no one to share the adventure with. Thanks, + Zampano, I didn’t know about this at all. I thought multiplayer would be one of the main features of this game. No traditional Multiplayer must be expected until many months after launch. That was said again, and again and again. The only question – why the space is not black? Is it colour dust everywhere? From what I hear you may never encounter anyone you know. Because everyone starts in different places. I hope they fixed this because if I can’t play with friends it seems like it would get very boring after awhile. Will this be multiplayer would love to be able to explore planets with my girlfriend? Cant wait but i’m still trying to decide between physical or digital edition of this game. Eeeh i’ll flip a coin. Nerding out so hard. Can’t wait to see the other trailers. Its five-year mission: to explore strange new worlds, to seek out new life and new civilizations, to boldly go where “No Man” has gone before. Ha… good thing you didn’t say Sky. You could have got sued. Already got my Limited Edition Pre-Ordered on Amazon. This has been one of my most anticipated games since its announcement, and man, it feels so weird to finally be so close to release! I can’t believe it’s here! Can I play with my friends? I don’t want to explore the universe alone, who in their right mind wants to have the entire universe to themselves? Make some way that we can meet up with our friends so we can travel together and explore. Otherwise this game won’t ever see it’s true potential and end up being a bargain bin game. I’d love to explore the universe alone. I’ll leave it at that. But with other people would be more… enjoyable. Especially if funny stuff happens. I’m sure there’s still a few glitches to laugh at. But that’s your opinion. I would love to have that whole space to myself. There’s nothing stopping me from having a chat open with friends who are also in the game and talking to them about what I came across. I see no reason to change the game from how the designers had originally planned it. They had a vision and a dream of how they wanted everyone to play the game. If it’s truly something that’s going to bother you then this isn’t he game for you. Believe me with 18 quintillion planets to explore it’s gonna be a long time before most people get bored. Absolutely beautiful, just when I thought I couldn’t get more excited! Just love whatever the heck that creature is next to the deer-like thing, haha. This is one game that I’m going to have to be careful with, as it will push all of my addiction buttons. I’ll just keep going and going if I don’t set limits, just having to see what is on that next planet on the horizon. And virtual photography will keep me occupied endlessly as well. Just a few of the images there would make great wallpapers. I am super excited for this game. I pre-ordered it for PC. Elite Dangerous and Star Citizen are wicked. I’ll love this game too. But i wonder if some players will get frustrated and quit because they can’t find other players. And i wonder if players on PC can play with players on PS4. I’ll live it even if it does become a single player experience. Tick,tick…. so patiently waiting …was one of the first to pre-order. I just hope they dont offer a better pre order deal as we get closer. Had that problem with Destiny. …. Unfortunately, it appears that while TECHNICALLY this game is multi-player, as others have said, it is highly unlikely you will ever stumble across another player, never mind someone you WANT to meet and/or play with. I am now seriously debating canceling my preorder, as I am not interested in wandering the universe alone. Part of what attracted me to the game in the first place was the suggestion that the multiplayer aspect would allow you to play with friends (even if it was limited to a small group, rather than Eve-like mega-organizations), see what other people created, how they changed planets, etc etc, because that stuff interests me. However, it seems like I will see none of that, so as others have asked, “Well, what’s the point then?” Sure, exploration is neat, but if you NEVER come across another player’s contributions to the game (beyond perhaps naming a planet/star/ critter), then I fail to see the appeal. I don’t want/need kids p|ssing in my sandbox, so the less I need to deal with MP the better (for me). As long as the MP part is optional I’ll be happy. Indeed. It’s a pretty awesome quote. I think I’ll hold off until they confirm PSVR support. I was hyped about this game. Now I’m worried. It will be only 6 Gb. Well, even If It the planets are random genarated, 6Gb is a pretty small number for só many planets… If It will be focus only in exploration, It might get old fast. Well, I don’t know. I just hope It will be awesome, but I’ll wait for reviews. That’s one of the main points of procedurally generated content, a few lines of code create a normally metric ton of static stuff. I.E. its supposed to take up a ton of less room. The disk doesn’t have a single planet on it. The planets are generated when you get to them and are deleted when you leave them, with details of the planet saved, but not the actual planet itself. Most of what’s on the disk is audio. @MauCamper The vanilla version of Minecraft was less than 1GB and the world is pretty big in that game. Please don’t let No Man’s Sky be the 2016 equivalent of Haze 2008. I’ve not seen a game with so much hype (primarily positive) in a long time, and I really hope that it doesn’t disappoint. I have faith, but if I’m being honest, I’m a little nervous. Is there a way to have the “to be seen by fellow space pioneers” junk turned off? Last thing I care about is a bunch of stuff named/tagged “YourMomzABlahblah” or “DildoBaggins” or other prepubescent drivel. Game still looks great but just looks…with the hype above this game I can sniff from miles away the smell of flop.Or maybe not really that…almost sure game will be good but because of the hype on it people will call it a disappointment and bla bla bla like most of the hyped games this gen.”Gamers” these days lol. Hype is only a problem when people expect things above and beyond what the devs have ever indicated they would deliver. I’m super hyped for this game, but my expectations are “minecraft-lite in space”. So as long as I get that, I’ll be extremely happy. The problem is people thinking they’ll be able to fly around with a dozen friends and destroy trade ships, or carve phallic shapes into a planet’s surface from orbit. As long as expectations are kept in check, hype is fine and doesn’t necessarily lead to disappointment. Of course as you said, “gamers” these days. They’ll be disappointed the game doesn’t make them a sandwich. But I’ll be over here in my corner with God Eater: R, Star Ocean 5 and No Man’s Sky, loving every minute I get to spend with these games. I’ve had it on Digital Pre-Order since came to the store. My wife and I are going start it up at the same time on both of our PS4s. We”ll both be putting our trip to the center off till we reach each other. Eager to leave reality and take my journey in a new universe. I can finally fly to different planetד and mitigate my intense need to go on a galactic adventure! lol so its a game for people who just want to waste time with no actual things to do , fly from planet to planet to see the same generic random stuff and wooo we get to name plants ? wow . this is sad everything i have seen makes this look like a joke and the PR team is destroying just look at all the sheep they have suckered in already with no real gameplay and comin out and saying hey there is no real game play you just fly from one generic random made planet to the next and name plants , just go here go here name this name that and to boot $80 in Canada lol good luck it should be $20 at best . Ayyyy, look at all the misinformation. This video shows off 1 of 4 different ways to play the game. The others will include space and fps combat, resource collection, lore discovery, upgrading your ship, suit, and multi-tool, establishing trading routes talking with one of the four alien races, all of which have their own language you have the ability to learn, you can explore and scan planets, animals, and fauna to turn in for money. Pretty sure there’s more I’m forgetting, but that’s a good bit of it. All of that is with the general goal of racing to the center of the galaxy where stuff is supposed to get really weird and more difficult to traverse. The Game isn’t for everyone, but there is certainly plenty to do for those that are interested in an ambitious space sim. Ohh i dont know if buy it from PC or PS4.. i need to see how well works this final version in the ps4. Who’s willing to bet one of the first things some one is going to do is name something in no kane sky your mum or something else along that line . The game looks good let’s hope it lives up to the hype. This, Mafia III and Battlefield 1 are the only games coming out this year that interests me…..So looking forward to this one! Can’t wait for August! Plus, it releases just in time for my birthday :D So I can discover a planet on my birthday. I really hope it’s what they say, 18 quintillion planets. Not just 1 planet with 18 quintillion skins. Otherwise, unlimited exploring plus Spotify will make this a good sim. If they add PSVR support it will be like chocolate syrup on ice cream. When those skins mean you can find volcanic planets, ice planets, and planets with toxic atmospheres, etc… I’m okay with reskins. But everything is being created by code, from the asset collection they’ve made over the last 4-5 years. Different sizes of planets, different ecosystems, different flora and fauna. You could find a planet with no water. Or a gas giant. Or one with massive cave systems you can flood by blowing holes from the cave system into a connecting body of water. As Sean has said, this game is about exploring a universe. Each person can get out of it what they want to. But that also means it definitely isn’t for everyone. But with Spotify or VR, it should be quite enjoyable for anyone who jumps in. I’m just glad they finally updated the PS Store page’s release date listing. I was starting to get a little worried we’d have license/unlock issues as some other games have had in recent history. Really looking forward to playing this in 3 1/2 weeks. Oh, they finally updated it? That’s great! I was getting a little upset every time I looked at it, and it said December. As of right now Best Buy has Limited Edition available for Pre – order. Grabbed mine last night. Really excited for this game. Does anyone else get the feeling that if you do REALLY well in this game, you’ll get recruited to fight against Xur and the Ko-Dan Armada? I don’t really know what “really well” means yet, in the game. I see people projecting and assuming, but I’m hoping it’s something new. Looked up André Gide on Wikipedia! Then looked up the article’s revision history. Solid. I cant be the only thinking this game maybe all hype. Big hype tends to fall flat. I have been waiting for this game for a long time, couldn’t been more excited, this “Space Survival” type of game is something brandnew for me. Will recent news about Genicap’s patent on the “Superformula” further delay this game’s release?